To access Bb course, visit the My Institution tab and click the course’s name from My Courses module. A. 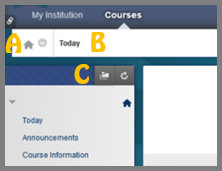 Course -to- course navigation – use this feature to access all the courses you are enrolled in. Click the downwards arrow next to the house icon so as to access the contextual menu and select another course. B. Orientation bar – use the orientation bar next to the house icon, so as to navigate to previous pages or visit again the home page. You are strongly suggested to use the orientation bar and NOT the web browser’s back button for navigating your course, due to a page expiration message that might be generated. C. Course menu – is the menu on the left side of your page which allows you to access the various course sub-areas. To visit an area into your course, click the corresponding menu item. – Display Course Menu in New Window – it is a detached menu that always displays course materials as a directory tree. Expand the view to reveal the hierarchy and navigate through the course. If you cannot see the course menu just move your mouse pointer near the course menu frame border. That way an arrow will appear. By clicking that arrow you are able to expand/collapse the course menu. Announcements: Use it in order to view the specific course’s announcements. Course Information: Here you will find course related information like meeting times, outline, syllabus, policies and procedures. Books and/or eTextbooks: Books in this area your instructor provides you with your course’s book. My Instructor: Provides information about your professor. Documents or Notes: In this area the instructor will be posting, notes, presentations, files, lesson plans, URLs, or anything needed as a course material. Assignments: In this area you can submit, edit or save your Bb or Turnitin assignments. Tools: In the Tools area you will find all the available for your course such as the MyCoursEval, Send Email, Calendar and others. For more information on Bb assignments click here and for information on Turnitin assignments click here.